Mature fruit ready to crush! be trust, on both your parts so that you can work together effectively. Of course, if you own your own groves, that’s the best case scenario, and you control everything. Things you need to monitor closely: Watering – deficit irrigation is hugely important to master. Everyone’s orchard will be different due to climate and soil. Watching the amount of water going onto trees starting in mid-summer for California, after pit hardening, is a good time to start (mid July – early August). I’ve seen growers keep just the right amount of water on their trees, keeping the olive right on the verge of wrinkling. This is ideal for making complex rich extra virgin olive oil but takes time to master. As harvest time nears, deficit irrigation becomes even more important, and I’m always pushing to have growers take the water off their trees right up to harvest. Getting their fruit as close as they can to wrinkling like a raisin. Fertilization – is like giving your trees vitamins, consult with your local fertilization company for best results. Have them come out and test your ground to recommend what is needed. Pruning – I mention pruning because I’ve seen growers cut back trees so much that it has stunted their growth for several years after. Especially if their field labor is not educated properly. Learning how to prune correctly is important, and will keep your trees producing regularly. Knowing when to harvest your fruit might be the most important step in this entire process, because it will determine the flavor of your evoo, and once you crush, you can’t go back. So timing is critical. If you have the ability to test your fruit for oil content and sugar, then you can create a chart after several years of data, that will eventually be a road map for you to gauge your harvesting time (for smaller growers, you can get the same tests perfomred by sending your fruit to a local lab, or sometimes some of the larger producers will do it for you, if you ask). Harvest time also depends on the flavor you want. Harvest early for more robust, green & grassy evoo’s, and later to make more delicate, smooth & buttery evoo’s. You can gauge harvest time visually too, which is how I’ve always done it, my dad has done it, and my grandpa. Visually, we look for 50%-60% color, where the olives are starting to turn purple on the tree, or are already purple. That said, there are some varieties that you want to harvest more on the green side like Frantoio and Leccino to take advantage of their robust rich flavors, and high polyphenol content. If you wait too long, and the fruit starts to turn purple for these varieties, you’ll make softer oil, without a lot of complexity, and you can’t win awards with oil like this. This takes some trial and error year to year to get it right unfortunately, but can turn average oil, into an award-winning oil. How you harvest can affect quality as well. I’ve used every method out there, and to produce the best quality evoo, hand harvesting is king. That said, it’s also the most costly way to harvest olives, time-consuming, and labor-intensive. Therefore I have also “knocked” trees with huge poles and tarps on the ground to catch fruit, used pneumatic rakes, shaken trees with a nut shaker, and used new methods with over the row harvesters, for the super high density plantings of Arbequina, Arbosana and Koroneiki. The fastest harvesting method manually is “knocking.” However it can damage fruit very quickly from being hit off the tree, to bouncing around on the tarp, or worst of all – being stepped on by your harvesting crew, who really cares little about your fruit because they are paid by how much they can pick in a day. My recommendation is to hand-pick as much as you can. If that doesn’t work, then “knock,” and if you do, have an agreement in place with your miller that they will run your fruit as soon as it comes in from the field to avoid oxidation and deterioration of the fruit. Time is of the essence. For mechanical harvesting (over the row harvesters), the same thing applies. Get it to the mill quickly, because the olives are literally beaten off the tree with these machines causing bruising and broken flesh. These harvesters are highly efficient however, quick and the most cost-effective method of getting an olive off the tree in the world. A quick word on using a contractor to harvest if you are on the fence trying to decide…If you have 3 acres or more, I’d hire a contractor to hand harvest for you, unless you own super-high-density olive trees and are lucky having a mechanical harvester at your fingertips. Trying to harvest on your own, or with friends and family can end badly. For many reason: injuries, the amount of time it takes, arguments, sore hands and bodies, as well grumpiness – seriously, I’ve seen it all, and you don’t want any of this when you are trying to run a business. Find a good contractor, and keep them happy. Pre-arrange your transportation from the orchard to the mill. I’ve been in situations where I completely over looked how I’d get fruit out of the orchard, needing a forklift on site, to under predicting the amount of fruit to be harvested and not having a large enough trailer to haul it all at once, and paying freight twice. Find a good hauler for large loads, keep them to a schedule, and set the time they need to deliver the fruit to the mill. Anything left open for debate, will be taken advantage of. One issue to watch out for is fruit that has sat too long before being milled because the delivery was late, or a truck was not filled completely one day, then left to fill the next day or over multiple days, or some other reason. Without attention to details like this, you’ll undoubtedly make “virgin” oil. 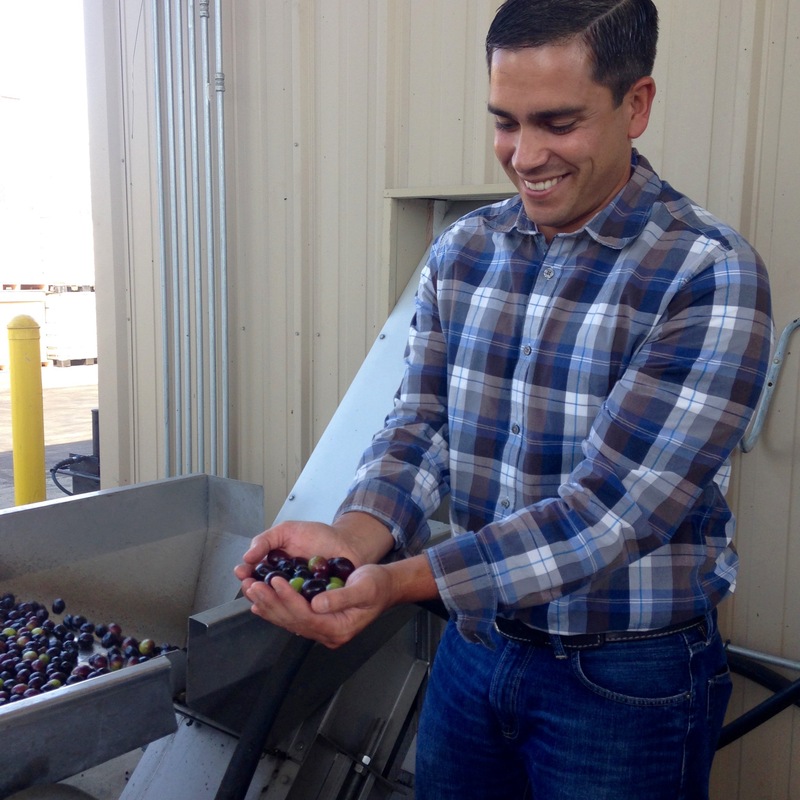 Fruit that has set too long gets hot, and starts to break down, which can produce oil that can’t be certified EVOO because the lab results will fail evoo standards, mainly FFA and Peroxide. You can catch this by sticking your hand/arm down into the middle of a bin up to you shoulder and feeling for hot mushy olives, or by taking a sample from a truck load. Deliver as quickly as possible to the mill. I realize this goes unsaid, but you can pre-arrange shipping and mill times to make sure your fruit is crushed as quickly as possible from coming off the tree. Ideally your fruit is crushed hours when off the tree, in the same day. If you harvest all day (like most of us do), have the fruit delivered that night and run first thing in the morning, or have you driver deliver first thing in the morning and have it run right away. Once your fruit has arrived at the mill, pre-arrange to have it run right away. Don’t let it sit. If your fruit does have to sit, make sure it’s in the shade, or in a cool area. If you can be present at the mill during crushing of your fruit, I would be there. This could help things move smoothly, and you can get better results. Of course you want to stay out of the way of the mill team, perhaps ask where the best place for you to stand/sit is, or how you can help, and then track everything, I’d take notes. Time the malaxers, watch the yield from the polisher, and constantly taste the oil coming out of the polisher. By doing this, you’ll be able to educate yourself on the process, and also be in a great position to make better oil each year by learning from mistakes, or seeing trends in your data you collect. Malaxing time and temperature, you should agree on beforehand with the miller. Ask them for their opinion, and gauge if you agree or disagree, and ask for changes to the method if you think they are needed. You are paying for milling whether you own the mill or not, so you should have olive oil made the way you want. If the fruit arrives on a warm day, say 80 degrees F or hotter, then I would consider no heat on the malaxers. The fruit is already warm enough. Technically, you shouldn’t go over 80 degrees F to make high-quality EVOO. Once over 80 degrees F, you can start to cook your oil, even though you may get better yields, compromising your quality. I wouldn’t go there if you are a small boutique producer. The addition of water to the milling process should be minimalized. Ask that the only time water be added to the process of making oil, to be times where aid is needed to get the olive paste through the system. There are many locations along the way where water can be added: crushing, augurs and pump tubes, malaxers, the decanter and polisher. Pumping oil into your container from the mill is important too. Make sure your container is clean, and ask to have nitrogen or argon injected into each container once it’s filled, before the cap is put on to protect your oil from oxygen. If you have multiple varieties of olive, going into one blend, I would crush them all together at once when at all possible. From my experience, the flavor is always better. Of course if you need to blend after the fact, which most of us do, then do your blending in small increments first, then in large to ensure you are hitting the correct flavor profile you want. “Crushed” oils are some of my favorite. The first one I ever did was mandarin crushed olive oil, with mandarins from Auburn, delicious! When it comes to making crushed oils, timing is important and having all your ingredients arrive at the mill at the same time, without having them sit. Again, if they do need to sit, put them in the shade or a cool location. Washing the fruit or vegetables you’ll be adding to your olives is very important if it comes in dirty. It can negatively affect flavor. Try to introduce it at the washer stage, so it can go through the washer with the olives. Slicing the fruit or vegetables can help the mill process it easier. I tried throwing in whole mandarins and lemons when I first started, and the crusher had a hard time with the volume, but I was also going through 6 tons of citrus. I tried slicing the citrus by hand too, and that took forever! Unless you have small amounts, I don’t recommend that. Eventually, an automatic slicer was purchased, specifically for slicing fruit, and that made all the difference in the world. It took one person to operate, and would slice the average mandarin or lemon into 4-5 pieces. How much fruit or vegetables to add? Well, this depends on many things, and it comes down to trial and error. It depends on the flavor of your oil being produced, because if you have light buttery oil, not as much fruit or vegetables will be needed because the flavor will stand out easily. The more robust your oil, the more fruit and vegetables you’ll need to add to have that flavor stand out. Error on the side of making the oil too strong, because you can always blend it out after production. The oil content in the olive plays a major role, and can change day to day, so adjustments may need to be made daily, so taste the oil being produced regularly. Also, year to year, the ingredient you are using can go up or down in oil content (or essence), just likes olives, so you may have to add more or less. The malaxers and decanter may act differently with the various ingredients you are adding. For malaxers, keep a close eye on time, you don’t want to over malax if you aren’t seeing the oil start to pool on the top, sometimes it just won’t happen when you are making crushed oils. Your decanter may also need to be sped up or slowed down as it processes to handle the different consistency of the paste. Again, all things that you’ll need to adjust on the fly, and come with trial and error. Last, and most important, I can’t say enough about making sure you clean your equipment thoroughly after crushing! The last thing you want is to run evoo the next day, after you crushed your flavored oil, and residue gets into your evoo, disqualifying it from being certified as evoo. Racking is an art in itself for some. “Racking” for me, is allowing the oil to sit in a tank or container for a period of time so that the solids and water in the oil drop to the bottom of the tank, and then the clean oil is transferred to a new container, leaving the sediment and water in the bottom of the original tank or container. I always error on the side of not letting the olive oil sit too long with sediment in it, because you leave more chance for something to go wrong. Racking is a natural process in making oil, and can add flavor to the oil, you just have to keep a close eye on your oil. There are a few ways to time when to rack your oil. Generally, I don’t like to go more than 30 days for any oil, however some oils might take a few days longer, or some might be much quicker. You just have to monitor your oil clarity visually daily after about 10 days of sitting. Once your oil starts to look clear, and is no longer cloudy, it’s time to rack. For some oils it can happen in a couple days, however, I’ve had the same variety year-to-year take different amounts of time. For instance, Manzanillo is typically always cloudy, and at 30 days I rack no matter what because I’ve had Manzanillo stay cloudy all year, and never clear up. When racking, make sure to rack into a clean container, and if using a pump, be absolutely certain you don’t pull from the bottom of the tank or container transferring sediment with the clean oil. Hold the pump well away from that layer of sediment to clean oil. What I would do is once you are done racking, pour “like” sediments into one container, let that sit for a few more days, and then rack that again. Following this process will get you down to just sediment, and you won’t waste as much oil. If you have large tanks with conical bottoms, it’ a much different process of course, and you rack by dropping sediment from the bottom of the tank, and the oil stays in the same tank. You just want to be sure you get it all out. Do not let your oil sit in its sediment past two months! If your oil sits too long in its own sediment, it will go bad, and not qualify as evoo. The sediment is fruit essentially with water in it, so it will rot and oxidize at the bottom of your tank or container, and your oil will take on those flavors and will start to taste fusty, muddy, rancid and/or old. During the waiting period (before you rack), be extra careful to keep your oil cool. A range of 69 F – 50 F is good. Once your oil is made, it should immediately be stored in a temperature controlled room, ideally at 69 degrees Fahrenheit or cooler. I would not go below 50 degrees F however. Oil can go bad within hours of being warm, particularly over 100 degrees F.
Over the year, continue to insert more nitrogen or argon to help protect your oil from oxidation, once every couple months is good. Oil does best when stored in large volumes! So keep your oil as long as you can, in the largest volume containers you can afford. I’ve always used totes for storage (265 gallon bladders in a cage). I know some are concerned with the plastic, but I have NEVER had a problem with them. They have to be stored correctly though, in a temperature controlled environment, ideally 69 degrees F. I have used some stainless steel tanks, which are a dream come true if you can afford them. Stainless steel is ideal for oil storage, again in the largest volume possible. The bottling process should be done as quickly as possible, and in a temperature controlled room. Be careful not to go too long before capping your oil when bottling manually, you are leaving time for oxidation, and also things to fall into the bottle. Handle all material with care and cleanliness. If something falls on the ground, throw it away (the 5-second rule does not apply here, and it’s on your honor!). One trick I’ve always used, is to ask my bottling crew to turn bottles upside down before filling them, just in case there was something inside. I’ve always stored all other materials in clean plastic Tupperware, that are never stored on the ground. Once bottles are filled, capped and labeled they should go right back into boxes for protection from light, and easy handling, then directly to temperature controlled storage, unless of course it’s an order, then ship it and get it out the door! For large orders, I have always bottled to the order, and rarely kept high inventory, so that the oil is at it’s freshest, and so that you can ship the product directly after finishing bottling the order. Again, storing oil in the largest volume possible will keep it at it’s best. Therefore I recommend keeping just the right amount of bottled product in inventory, to last you a month or two, but no longer. Oil can start to change flavor once you’ve bottled it, within a couple months (even if stored correctly), sometimes faster if not stored at cool temperatures. One of the worst things you can do is pre-bottle your oil for the whole year! Please don’t do that. It will go south in your bottle guaranteed, and by the end of the year it will be old tasting, and in many cases rancid…even if stored correctly! I’ve experienced this first hand. Wait for the orders, then bottle. Don’t let product sit, bottle to the order, and ship it when done – time it, so it’s right away! Once you have product ready to ship, whether it’s in a box or on a pallet, don’t let it sit in the heat. Hold it as long as you can in a temperature controlled room. Wrap your product well, like it’s going to war. Every single time, and never deviate from protocol. I buy special pallet bags, which are clear and cover a pallet up to 4 ft tall, anything shorter, I cut it off or tuck it under itself, then wrap it extremely well with shrink wrap. This will guarantee that your product arrives undamaged to its location. 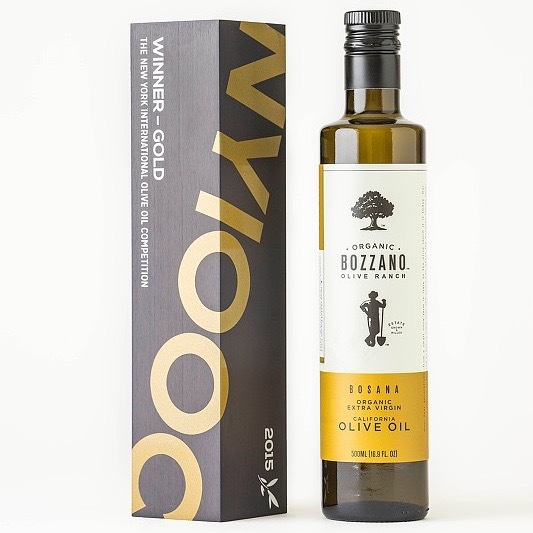 So now you are ready to taste, blend and choose your award-winning extra virgin olive oils right! I have that process outlined for you too! Which follows this post (as my two-part series). Click here to read it. I’ve covered every major step in the process of the tree to bottle. If you have a question, email me, I’m happy to answer: dewey@olivefantastic.com.